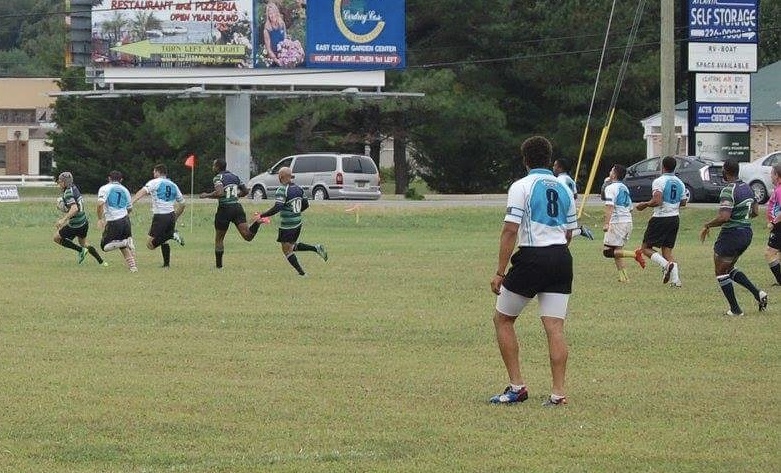 Severn River Men continued their successful spring season with a second consecutive win, this one coming against Delmarva RFC last weekend. Due to a snowstorm that covered the Annapolis area, the game was moved to Delmarva at the last minute. This sudden change of venue location didn’t seem to slow the gentlemen from SR down as they came away victorious, 12-0. It was a slow start for both teams, with most of the flow of the game stalled by numerous penalties called on both sides. Once play settled down after the first 30 minutes, Severn dominated in possession but could not find the try zone. After several near scores, including a marauding 65 meter run by Captain Mike Blimmel and a dive into the corner by Logan Reece, Severn River finally broke the deadlock just as the clock stroked halftime, with a hard charge up the middle by Lock Richard Maldonado. The second half was much of the same for the green and blue, lots of possession but not many points to show for it. Severn owned the set pieces on the day, with several stolen lineouts and scrums. Eventually, Blimmel did find the try zone midway through the second half to secure the victory for Severn. With it being a hard fought, low scoring affair, Severn’s man of the match was awarded to their hard hitting, tireless openside flanker, Lawrence McClain. Severn look to make it three on the trot to open the spring, with their first matrix match of the season against division leaders North Bay this Saturday in Aberdeen at 1pm.